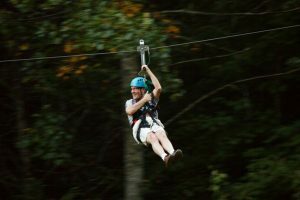 The highest, fastest and longest zip line in the Smokies! Fly 475ft high between two mountains and over a river! 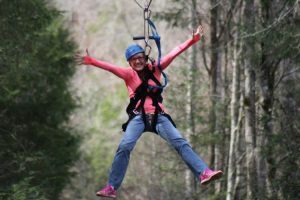 The best adventure park in the Smokies! We are known for our zip lines, but there is SO much more to do here! Zip over a waterfall with our Waterfall Canopy Tour! A favorite among all visitors! Are you a dare devil? Zip the Goliath which takes you 475ft up at over 55mph! In a time-crunch, the Waterfall Canopy “Lite” Tour is just for you! Walk across the 335ft long Bridge to Prosperity, and then explore the trails, river walk and kid’s obstacle courses on the other side! Until 2019, this was the longest Swinging Bridge in America! Take a ride on our extreme 8-wheel drive ATV! We’ll take you off-road through the wood, across water, and up to the top of the mountain! An awesome time for the entire family (ages 3 and up)! Balance beams, tight ropes, and invisible steps. Our Aerial Ropes Course has it all and will test your agility. Like a challenge? Our 60ft high Gorilla Climbing Wall will deliver, and top it off with a 65ft jump off of Head-Rush Plunge! Our Wylie Cider is the only Craft Cidery in Tennessee! We have all-natural, high quality cider like you have never tasted. Both soft and hard ciders available… and of course, free taste testing! All of the excitement and fun of Foxfire can work up an appetite! Don’t worry though, Zippin’ Pigs Snack Shack serves up tasty food and treats for the entire family! The Foxfire ziplines, especially the Goliath, were fantastic! Our guides, Blake and Shane, made sure we were all safe and had fun. Great experience with our 2 teenagers. What a fun way to start vacation. The atmosphere was so quaint and welcoming. The guides were great and the thrills were amazing! So glad we chose this place over others. It was fun to look around at the other stuff on property. Thanks for a great time! The Postlewaite family farm was converted into an outdoor adventure park in 2010 when Marc and Marion Postlewaite added the 7-line Waterfall Canopy tour to their farm after visiting a zip line in Alaska. In 2011 we added the 8-wheel “Bear Crawler” ATV tours through the rugged mountains. In 2012 they added the 330-foot long Bridge to Prosperity, which crosses 70 feet above the river to Prosperity Mountain. The Bridge to Prosperity was the longest swinging bridge in the United States from 2012-2019 and was modeled after the Capilano swinging bridge in Vancouver, Canada. Also in 2012 we added the Zippn’ Pig Snack Shack where hickory smoked pork is smoked daily (in season), and piled high on sweet Hawaiian bread and smothered in a special tomato based sauce – a true Tennessee barbeque recipe. We added the Aerial Adventure Course, a 5-lane 60-foot climbing wall and a kids obstacle course and play area in 2013. 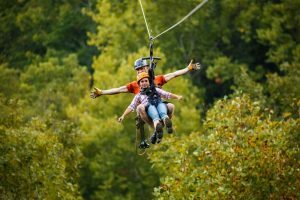 The following year we added the now famous 5-line Goliath zip line course, which has the highest, longest and fastest zip line in the Smoky Mountains. In 2016 we added the soon-to-be famous Wyile Cidery, where hand crafted hard and soft ciders are made from scratch and sold at the Foxfire Mountain Gift Shop. Still a family operation, the park continues to be a family run business operated by Marc and Marion Postlewaite and their son and daughter-in-law, Matthew and Stephanie. We have earned the highest rating on TripAdvisor due to our attention to detail and country hospitality. 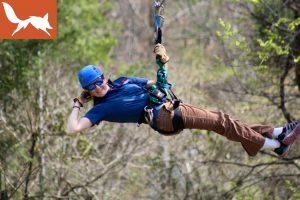 The aerial ropes course, climbing wall and Zippin’ Pig Snack Shack are seasonal from Memorial Day through Labor Day, while the zip lines, Bear Crawler, and America’s Bridge to Prosperity are open all year long.